every cut from the album. If you like what you hear, please buy a copy here. Hittin' The Note most recent review can be read here. 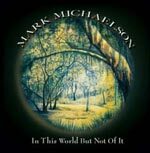 "Suited with a voice that perfectly matches the music, and a strong and down-to-earth production, Michaelson obviously can do no wrong on a CD that is covered with a tasty and delicate 'southern-flavor' from the first tune to the last. Well done!"